Greece tapped international bond markets with a 10-year bond earlier this year, its first such issue in a decade. But at 18% the unemployment rate remains the highest in the EU and so is its debt, standing at 180% of output. Mitsotakis camp is already on a war footing ahead of the EU parliamentary vote on May 26th, 2019. People come and go from his office, adorned with paintings, pictures of his family and his late father – a former prime minister – books, a model ship named “Leadership” and a stuffed toy lion. 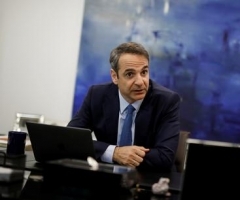 But Mitsotakis says it has not turned a corner - it is just comparatively better than 2015, when he says bungled negotiation tactics by Tsipras’s government almost got it thrown out of the Euro zone. Tsipras says he had no other option but to accept it. The economic monitoring framework includes meeting an annual primary budget surplus - excluding debt servicing costs - of 3.5% of GDP until 2022. Apart from pushing hard on “emblematic investments”, such as a real estate project at the former Athens airport and a Chinese investment at Greece’s largest port in Piraeus, his gameplan includes cutting corporate tax to 20% from 28% and tax on dividends to 5 from 10% within 2 years.